Choices were to be made. Hile lies at a crossroads. Here we could venture further west into unknown territory of the middle mountain road ór we could go back down to the hot steaming plains of the Nepal Terai and make a fast dash to Kathmandu. We chose the mountains in the hope of seeing some spectacular huge mountains further up north. We were stretching kilometres, taking our time and would be held up by something we weren’t expecting… But essentially we were on the final stretch by taking the middle mountain road to Kathmandu! You can find the photo galleries here: Hile to Kathmandu pt1 and Hile to Kathmandu pt2. We didn’t have a lot of information about the following section. Nowadays most common routes have been cycled ánd documented in blogs or on crazyguyonabike.com. Doing this research is also part of our preparation while planning routes and making choices about where to go and which roads to take. What we did know is that we wanted to avoid the heat and we wanted to experience Nepali culture away from main roads. So we took off towards Bhojpur and Diktel. Hile had been a surprising little getaway with a nice place to stay, atmosphere and sekuwa barbecued pork. We were then heading for the Arun, the largest Trans-Himalayan river passing through Nepal and originating in Tibet. 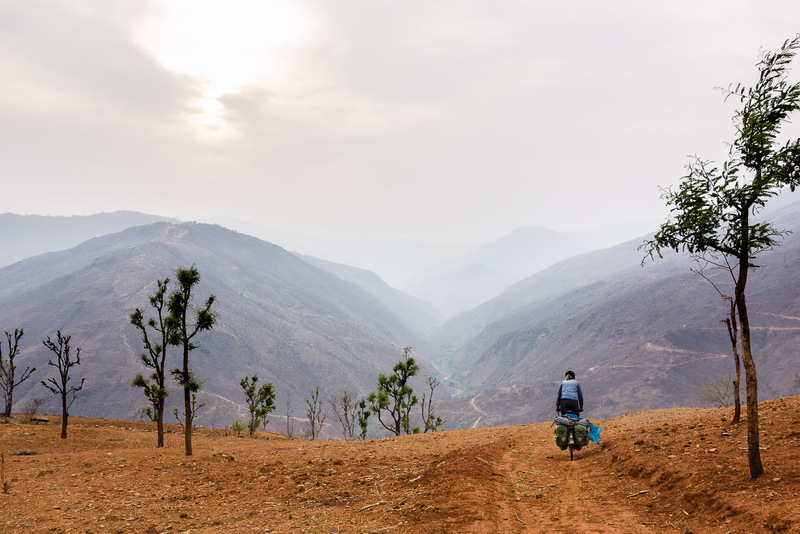 The road down was tough, we cycled from Hile with an altitude of 1900 meters down to approximately 300 meters altitude over a rough road with very sandy, rocky and rutted sections. It was comforting for us to see that trucks and busses were still using this road heading for Bhojpur, although we almost couldn’t imagine it with the road being so steep and so rough. We made it down to Leguwa for lunch (25 kilometre downhill took us the whole morning) and while we sat there we had our first experience with monsoon rain. Clouds came together quickly, we heard thunder and lightning and rain plummeted down. We waited it out and headed off when it started to clear. After crossing the river ,the road started heading up again immediately. The rain had mellowed but formed puddles on the sandy road which now had turned to mud. Apparently it had rained the day before also in this area and people were warning us that the road ahead was even in worse condition than where we were cycling. In a small village we asked around for a place to sleep and luckily a young man spoke some English. He had come back home from Kathmandu. We could stay in his brother’s house which was newly built. During the night we heard rain plummet down from the sky so we were happy to be able to sleep inside and curious how the roads would be like the next day. One word describes it all: mud. And it would be the theme for the next few days. We didn’t know but the middle mountain road has been a road construction project for years. The Nepali are building this road all the way through the lower Himalayas to provide alternatives to riding down to the plain. When it is finished it is going to be a great road, but until then it is a huge mess. Huge JCB’s and excavators are digging up the road, rain is soaking the road and trucks and busses are ruining all the work that is being done. Which makes us cyclists having no option than to push or wade through the mud. Which had its consequences on the bikes with wear on the brakes, rims, chain and actually almost everything. The going was super slow and multiple days in a row we averaged 30 kilometres because we were pushing the bikes 60% of the time. Going almost as slow on the downhill as on the uphill. We passed the town of Pyauli where we had been to our ankles deep in mud. Our panniers had a chocolate coating on the bottom and we were walking towards a long line of trucks and busses parked on the side of the steep road going up. There was no going through for them. The hillside was very slippery and a bus was revving and working to get on its way. We pushed our bicycles past (the next time we saw this truck was the next day when it was drier and they were passing us in a long line of trucks on their way to Bhojpur). Some parts of the road had not been dug up yet and there the cycling was mostly quite nice. Unless they had left the old cobbles which made for a very bumpy and uncontrollable ride. We had passed another pass and the downhill started with only cobbles and we were done for the day. The sun was going down and we found a small town. There was a small chance we could see mountain Makalu from this town because the sky was clear. We walked together with the man of the family further up the road to a viewpoint, looked towards Makalu and in that valley clouds were coming together. Apparently it was not meant to be to see the mountain. This family was very friendly and while we were taking rest from the day the children were doing their homework while the mother was cooking dhal bhat in the kitchen on the traditional fire. The mud was literally sucking our energy by sucking on our tires. We were contemplating taking transport by the time we were close to Bhojpur. We were there at lunchtime so didn’t venture off the main road into town but headed further. There was no transport anymore… Bhojpur was the last stop for all vehicles. Because of the starting rain the busses didn’t run anymore between Bhojpur and Diktel. We met many local people walking the section between these two parts because there was no transport at all, not even a 4WD or sumo. It made things easier because for us there was no other option then pushing on. Also we felt as we weren’t alone in the effort of transporting ourselves over longer distances. During the night we would have company in one of the local basic lodgings and in the morning they would set off on foot while we would (try to) cycle off (mud permitting). We reached a section where our road was not so clear. Our GPS track wanted us to make a turn off the main road, locals indicated that we should head onwards. We decided to consult Google Maps, Ncell gave us some nice reception in the middle of nowhere and decided to follow the locals directions backed up by Google. The road swerved along the mountain through villages and was in a bit better condition than the previous days. Just before the pass there were huge Rhododendron trees which had already bloomed but were still impressive. Crossing the pass the clouds were an eery colour. We had hoped to see Everest, or maybe just one of the high mountains but again clouds were hiding the views we could have had. We stayed at a local house where they made their own curd, ghee, tended goats and harvested vegetables from the garden. A nice little place. After so much up and down we were looking for a break once we reached Diktel. To make things easier just before we reached Diktel the skies opened and it again plummeted with rain. We found some shelter but eventually just cycled on and got wet. Never have we been more disappointed by a town we were looking forward to. We know that in areas people and towns and villages can totally differ from one another without there being any explanation. Diktel was a place where we didn’t want to stay longer than necessary. The only thing people were interested in was money. So after having to pay to camp in a school classroom we headed off early. We had been told about a cave along our route by a few. Nobody had really been able to explain where we could actually find it. It was supposed to be a holy place for Hindu and Buddhists. We had expected it to be on the way up to the following pass. Martin had decided to change his brake pads because the rain had been eating them the day before. In the meantime Susanne took a head start up to the pass. But there was no cave in sight. We thought we had missed it. We had no clue where we would end up for the night and around five o’clock, and another 40 km, we came around a bend and saw a small town. We also saw many many Tibetan prayer flags. All of a sudden there was a town of small hotels and we had found the precious cave Halesi! It was great timing as here we could find the rest that we were looking for in Diktel and hadn’t found. We immediately checked out the cave, which was nice and off course filled with bats and then decided to stay another day to give our bodies some rest from all the pushing. Locals had told us that we had approximately 40 kilometres of bad road to go before we would reach black top road. We had cycled the biggest pass and from now on it would be down and then slowly up to Kathmandu. We reached the Dudh Kosi river, cycled up a small hill and hit and intersection with a very smooth road. This lasted 4 km and we were back to rocks and gravel again. We were at an intersection where there was a road to the plains although we were heading further west and we asked when the next village would be. The man we asked seemed reasonable but het couldn’t answer our question. His response was: “it is better to stay here”. We would ask: “but when is the next teahouse?”. His answer: “there are none, you could better stay here”. We said: “between here and Kathmandu no teahouse?”. We were getting frustrated with the conversation and took off. There were villages along the way and 15 kilometre further we found a nice little place to spend the night. Signs next to the road were sometimes indicating Kathmandu. From 180 kilometres down to 120 kilometres. We were not far from the junction with what people call the Japanese highway. It is a new highway running to Kathmandu built or funded by the Japanese and becoming quite famous with bicycle tourers cycling from North East India to Kathmandu. We were meeting it halfway and were quite impressed by the road construction and curvy roads. Nepali people are also quite impressed by it looking at the amount of puke bags we have seen on the road while cycling it. The section we took started with a lot of up and down. We slept in a small town where coincidentally we met another cyclist in the hotel, Yoly from Spain. The next day we cycled separately but met quite a few times during that day. The road went up very gradually following the Sun Kosi river. The last pass didn’t require too much effort. 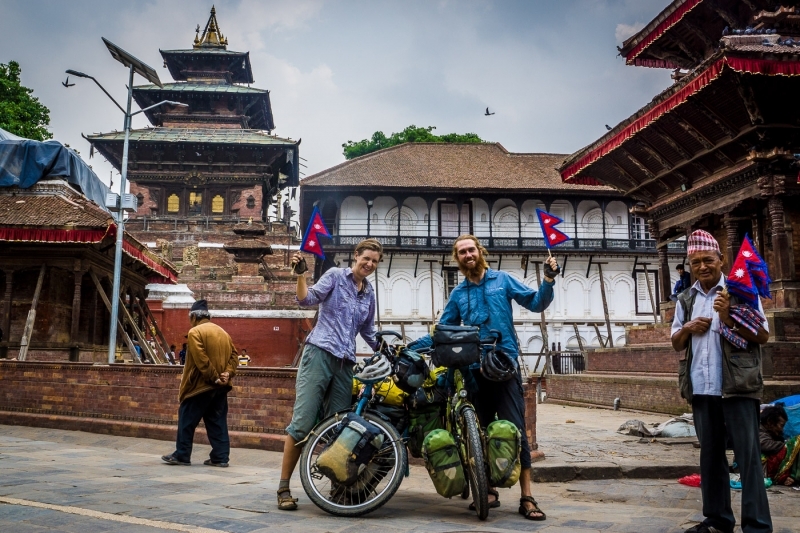 We were started to get excited by the thought of Kathmandu although we knew cycling would be over then. A thought that we also almost can’t bear. We topped the last pass, made our last Vlog and cycled to Dhulikel. We found a small guesthouse together with Yoly. Only 30 something kilometres to go till the end of the journey! The end of the cycling part of the journey. It was smooth going mostly down to Kathmandu. We had our first sight of Kathmandu valley. Traffic though was picking up and we had a few tricky traffic situation coming into town. We made it into Durbar square for some iconic celebratory picks and headed towards Tings Hotel and Tea Lounge. A place where we had been invited and which gave us the possibility to unwind from this epic trip. It has been amazing, epic and a roller coaster, it has also been life in its full form. We will write about our feelings and reflections in more blog posts that are to come.